I have one more salad recipe for you this week. Hippity, hip-hooray! Today it’s all about a great, flavorful pasta salad. Have you ever made a pasta salad, poured a lot of dressing all over it and then put it into the fridge until you were ready to serve it? Pasta noodles really have a way of soaking up all that dressing in a hurry. The down side is….it doesn’t really soak up the flavor of the dressing. I have found adding a little olive oil and seasonings to the pasta, letting it chill out in the fridge for a bit….and then adding your dressing just before serving makes a flavorless pasta salad jump up and cry out “You better believe it baby! You are going to LOVE me.” Isn’t that just what you want? 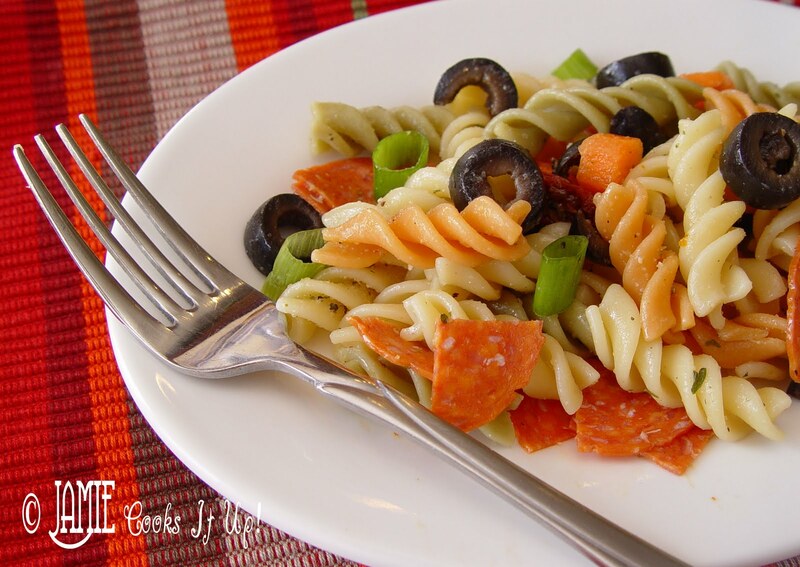 Pasta Salad with Personality. Everything is better with a little personality, now isn’t it. 1. Boil up your pasta, rinse in cool water and set it aside in a large bowl. 2. Chop up your veggies and the pepperoni. 3. Add all ingredients, but the Zesty Italian Dressing to the pasta and mix well. 5. Just before serving pour the Zesty Italian Dressing on to taste. What a great idea about adding seasoning and a bit of olive oil to really make a pasta salad pop! Thanks for sharing!! Thanks for reminding me of this one! I used to often make a very similar one that I loved. I remember mine had small cubes of provolone cheese in it instead of the Parmesan though. Either would be delicious! I just made some and it was really awesome! I like the color and the combination of the ingredients! What is Johnny's Garlic seasoning? I don't think we have that in Ohio. Your site with all the ads and surveys is just TOO MUCH! It takes forever to get around because you constantly have things loading and moving and ugh! It could be great but it’s just too cluttered.